we all know this, we all see it reflected in our open rates (unique opens vs total opens) and we see it in our tracking pixels - where the email is opened. so what's the big deal, how is gmail not doing any us any favors? look at these examples. they are all the same email, the first is from my mobile phone, the second is from my ipad - both of which use the gmail app - and the final is the footer content of the email from my web-based gmail. 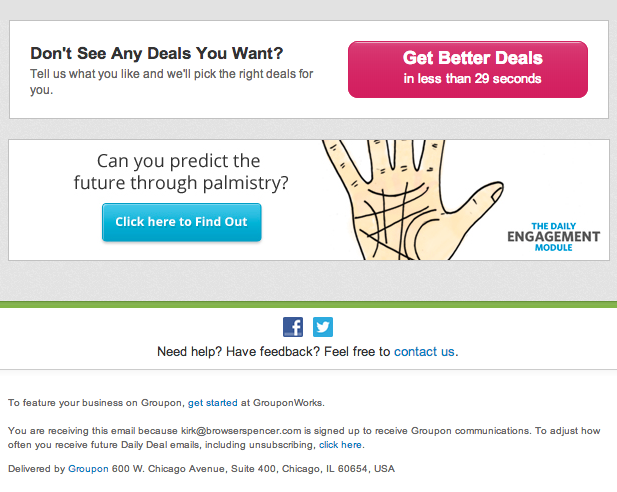 this is a message i received from groupon on november 18th. and honestly, this is about the time i started to notice this kind of treatment in my gmail account. first it's important to point out that this design is not responsive. and that due to its length, gmail truncates the message in all of the boxes - mobile phone, tablet and even in the web-based client. again the same message, but this time rendered in the gmail ipad app. the message isn't responsive something we discovered in the graphic above, but it is mobile friendly, and renders nicely on the ipad, and most likely other tablet devices. once again, gmail truncated the message - asking me to download the remainder of the message, but you'll notice that in this rendering there is more content included in this communication. that same content is missing from the smartphone version, and represented by an ellipse at the bottom most left of the rendering. i know it's hard to see it in these messages, but i didn't want the message to over-powered by the graphics. and now finally, here is the content from the web-based client. i'm only attaching the part that is missing from the smartphone rendering - and it will prove my point. gmail is removing the "footer" information from these long emails. from a design perspective, not the biggest deal - let's face it we all hate the footer section, there is nothing you can really do to make them attractive, and we don't want people going there for the legalize anyway - who really wants people to unsubscribe from your emails? congress does, that's who. since gmail is removing the can-spam compliant information, they are making it harder for our subscribers to unsubscribe. and since there is nothing else you can do to make the email reveal what is hidden by the ellipse that the place instead of the content, individuals are going to start hitting the "this is spam" option and putting our sender scores and reputations at stake. it's undeniable that gmail and google are the power-players in the world of email and the internet. and that we have to play by their rules, but at what costs. i would argue that with gmail doing this to small screen devices, they are violating their own "bulk sender guidelines", which state that an unsubscribe link has to be prominently displayed in the body of the email. but readers the world over have become accustomed to the basic anatomy of an email - preheader, header, body, footer - and that familiarity has made it easy for people to find the place that you need to go to unsubscribe from a sender's database. in the past gmail asked that bulk mailers actually put the unsubscribe link in the preheader, but we all revolted and said "no, we're not going to do that, we don't want the first thing readers see is an unsubscribe option", but it looks like gmail may actually get their way in the end, because individuals are going to start making the communications as spam - or worse yet, reporting email marketers as violators of federal can-spam regulations - and we'll have no choice but to put the unsubscribe information at the very top of the email.